We are delighted to kick off 2017 with a very special Lessons Learnt. A family fishing trip went awry, but the well-prepared skipper was able to call for help and launch a speedy rescue. Victoria Police praised dad Nathan, who was on the water with his nephew and seven-year-old son, for his actions after their boat hit a sand bank and began to sink in Western Port Bay on the evening of 16 January. The quick thinking skipper made a distress call on VHF radio, let off a number of red flares, and activated an emergency position-indicating radiobeacon (EPIRB). All three methods helped alert emergency services to the position of the stricken vessel and they were soon located by the Victoria Police Airwing about three nautical miles offshore. The family was picked up by Volunteer Marine Rescue who brought them back to dry land at Stony Point. Nathan tells Maritime Safety Victoria that prior to the incident, he'd been enjoying the fishing trip with his son and nephew (pictured above). When the tide turned and it got dark, the trio believed their navigation device would guide them safely back to land. However, Nathan says the shallow water alert did not go off and they hit the sandbar. As the boat started sinking, they realised there was no one around to help. Nathan says he'd like to see EPIRBs mandatory for all boaters, because without all the safety equipment he had onboard, "we would have surely died". But the scary experience has not put him off boating; Nathan says he feels safe because he knows the emergency beacon is so fast-acting and effective. "I want to get the message out to get an EPIRB," Nathan says. "You'd have to be a halfwit not to have all the safety gear on the water." 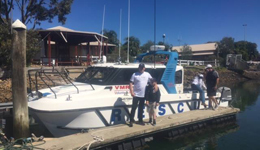 A week after their accident, Nathan and his son returned to the scene under happier circumstances to thank VMR Hastings for their help.